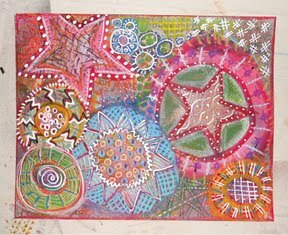 I belong to a Yahoo group called Zentangle Inspired Art. I decided to join in on a swap which ended up being a lot of fun. Each participant of the 4 in 1 swap was sent a sheet of card stock with a "string" on it. Everyone got the same string. The picture on the left is what I created and sent in to be cut into 4 pieces and 3 of my pieces were sent to other people. I got 4 pieces back, one of which is my own. Don't you just love it? It is so cool to see how the pieces all go together so well. Can you find my piece? The group has many different kinds of swaps and it's great to look at their albums to get inspired. Go check them out and join in on the fun! Your bead work is really great like the added touch of the findings. Your swap piece is pretty amazing as well - how fun to to see your piece with the other 3. I love your beads! Your 4-in-1 looks so great It's awesome to see them pieced back together again. Super beads and great four in one swap.